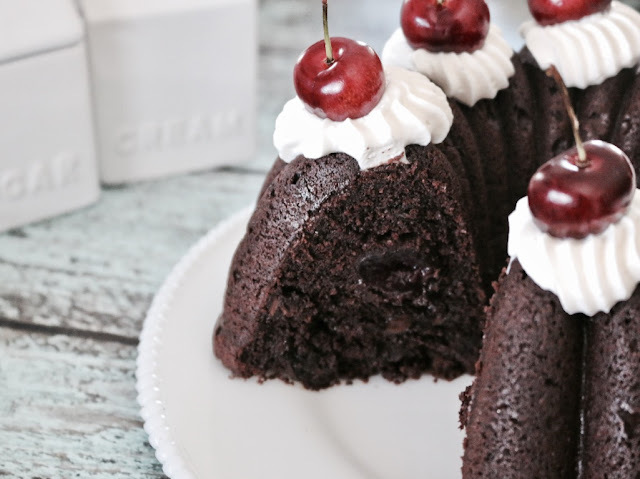 Chocolate cake, cherries, kirsch, and whipped cream. 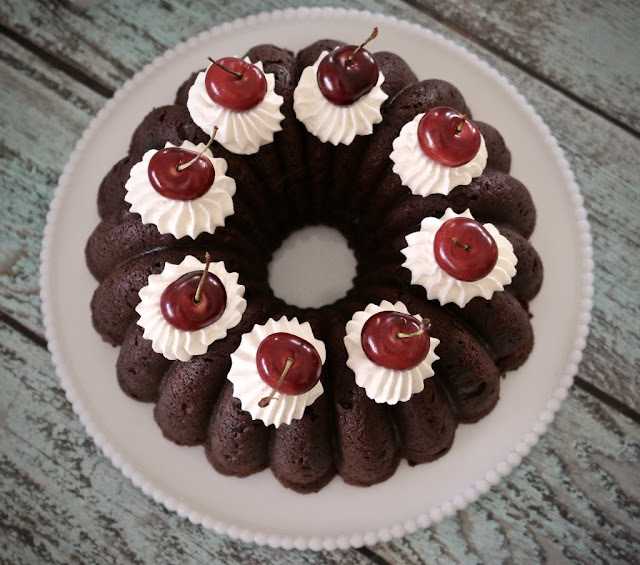 All of these add up to a Black Forest Cake, and as this is my husband's favorite cake I turned it into a bundt for this month's #BundtBakers theme of Dad's Favorite Cake. 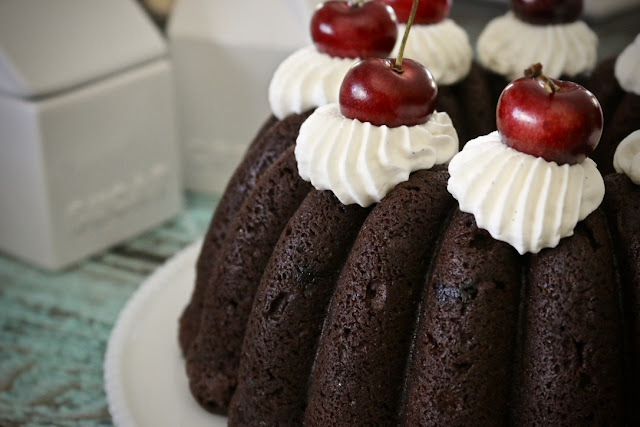 For me, maraschino cherries and canned cherry pie filling have no place in a Black Forest Cake. Maybe this is because I grew up in Australia and neither of these ingredients were popular, and instead fresh cherries or canned dark sweet cherries were always used to make the cake. The recipe I used called for dried cherries, but I also purchased a tin of dark sweet cherries to use in the center of the cake. Traditionally a Black Forest Cake is made with several layers of chocolate sponge cake, and alcohol called Kirsch is poured over each layer and allowed to soak in overnight before it is assembled. Kirsch is a clear brandy made from sour cherries, and it is not sweet. Since I knew I would only use a small amount and did not want to have the bottle sitting in my cupboard for a few years, I made what I am calling a poor-man's kirsch. I mixed a small amount of regular brandy into the juice from the drained cherries, and then brushed this liquid generously over the slightly cooled bundt. It actually worked out quite well, and was a lot cheaper than purchasing a bottle of Kirsch. It may be a no-no because of the raw eggs, but I always try a small amount of the batter for my cakes-a habit I guess. This batter tasted just like a hot chocolate and was lovely and thick, and it is now going to be my go-to recipe for any other chocolate bundt I want to make - chocolate mint, chocolate peanut butter, chocolate hazelnut etc. To make a cherry center from the drained cherries, I simply placed half of the batter in the cake pan and then I placed a ring of cherries around the middle, making sure that they did not touch the outside or inside wall (the tube) of the pan. I then poured the remaining batter over the cherries to encase them, and after a gentle tap to remove any air bubbles, off to the oven it went. The cake baked like a dream and had just the texture I was looking for, a soft crumb but not too soft that it would crumble once the cherry-brandy mixture was brushed over the top of the cake. 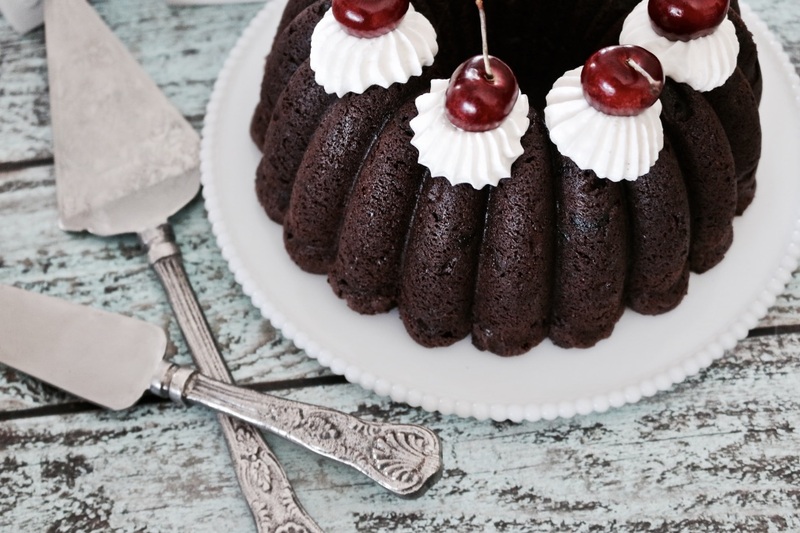 Do be careful though when you pick up the bundt to place it on a plate or cake stand. For this job a large spatula will be your friend and help steady the cake. You could try to cut the cake in half and then pour the liquid over the bottom and top layers, but I decided that I wanted to keep the traditional look of the bundt. After allowing the cake to fully cool, a little cream was piped on top and some fresh cherries were the finishing touch. 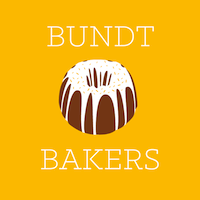 If you would like to know more about #BundtBakers and see what the other bakers made for our Dad's Favorite Cake bundts theme please scroll down below the recipe. Spray a 2.5 liter (10-cup) Bundt pan with baking spray, and set aside. Drain cherries and place on a paper towel, reserve the juice. In a large bowl, sift together flour, cocoa powder, baking powder, baking soda and salt. In the large bowl of a stand mixer fitted with the beater blade, beat butter and brown sugar until light and fluffy, about 5 minutes. Add vanilla extract and beat until just combined. Stir flour mixture into butter mixture alternating with sour cream, making starting and ending with the flour mixture. Stir in chocolate chips and dried cherries. 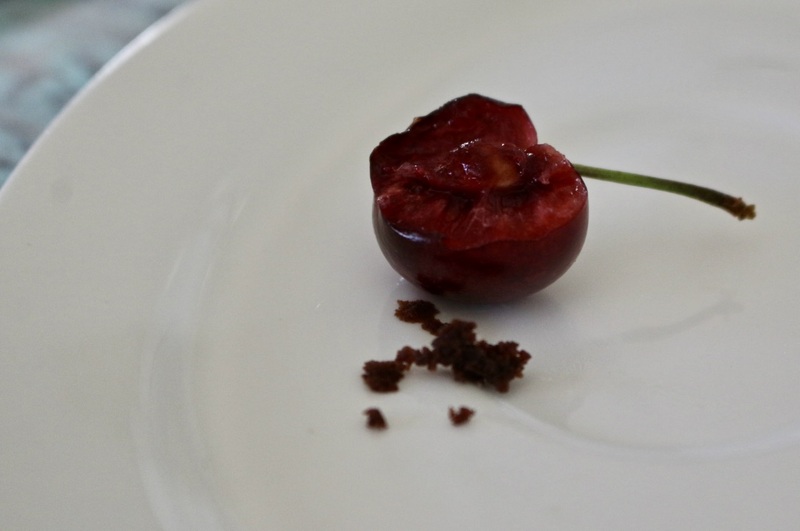 Pour half of the batter into the prepared pan, then place a ring of the drained cherries around the middle, making sure not to touch the side or the center of the pan. Add the remaining batter, gently tap on the counter to remove any air bubbles, and then smooth the top with a spatula. Bake in the center of the oven until cake tester inserted in centre comes out clean, about 1 hour. Whilst the cake is cooking, add the brandy to the cherry juice and set aside. Once cooked, remove the cake from the oven and let cool in pan on rack for 10 minutes. Place a cooling rack on the bottom of the cake pan, and using a tea towel or oven mitts, grasp pan and rack and turn over. Carefully lift off pan to release the cake, then let it cool for another 15 minutes. Place a tray under the cooling rack, and taking a cake tester or thin skewer poke holes in the cake about half-way down. Using a pastry brush, gently brush the cherry juice mixture over the top of the cake and allow to absorb. Allow cake to fully cool, then move to a plate or cake stand. Add the cream and vanilla extract to a bowl, then whip until stiff peak appear. Decorate the top of the cake with piped cream, or serve on the side. #BundtBakers is a group of Bundt loving bakers who get together once a month to bake Bundts with a common ingredient or theme. We take turns hosting each month and choosing the theme or ingredient. I was lucky enough to be the host this month, so I chose Dad's Favorite Cake - just in time for you to get some great ideas for Father's Day, which is next month. You can see all our of lovely Bundts by following our Pinterest board. Updated links for all of our past events and more information about #BundtBakers, can be found on our home page. Black Forest Cake is one of my favorites. Mostly because there is no icing but only whipped cream. I love this Bundt version and can't wait to try it. Beautiful! 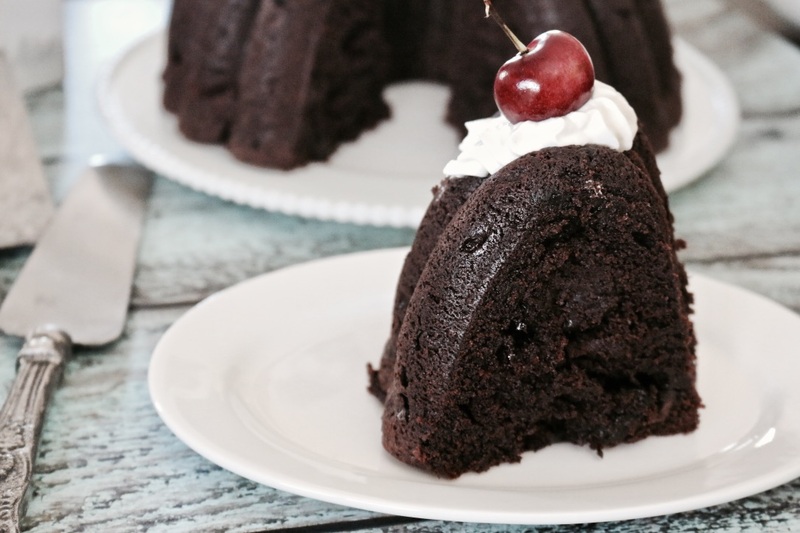 Spring cherries are one of my favorite fruits and this cake certainly does them justice. I'll take real cherries over canned cherries any day. This cake looks like perfection and makes me want a big ol' slice right now! Seen this beauty on IG and had to come here for the recipe. This looks amazing!